Hello and welcome back to Finish it Friday! 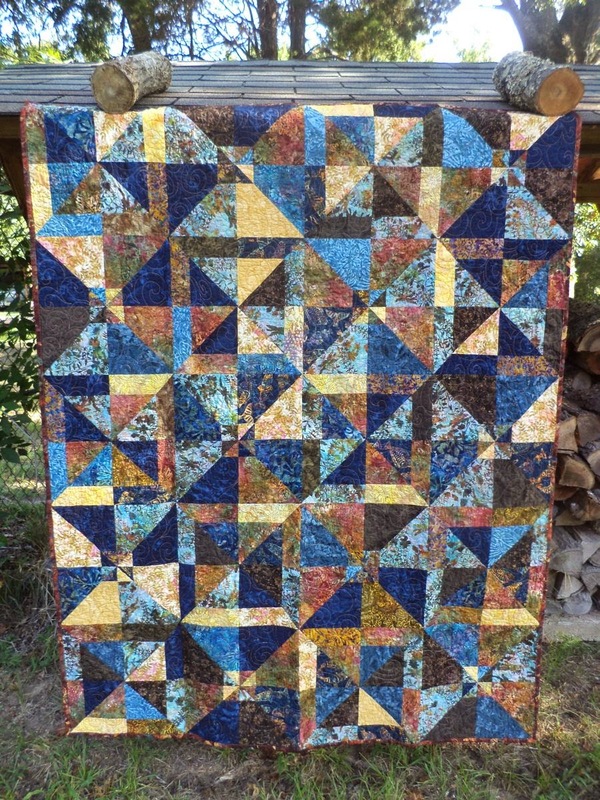 This week I have the batik quilt I made using Cluck Cluck Sew's Summer Slice pattern. This quilt really hasn't been featured on the blog much, mostly because I made it so quickly (as opposed to the designs that linger on the design wall for weeks.) I sewed this top in just 2 days. I have been collecting batik fabrics for years, but doing it casually. I pick them up when I see them in a remnants bin or grab bag, but haven't been seeking them out. I had no idea I had this many until I started cutting them for this quilt! And of course, I could make several more of these quilts and still have plenty left. ...I swear fabric multiplies in our stash when we aren't looking. I quilted it all over with FMQ swirls in a gold/tan colored thread and used the same thread for the back. 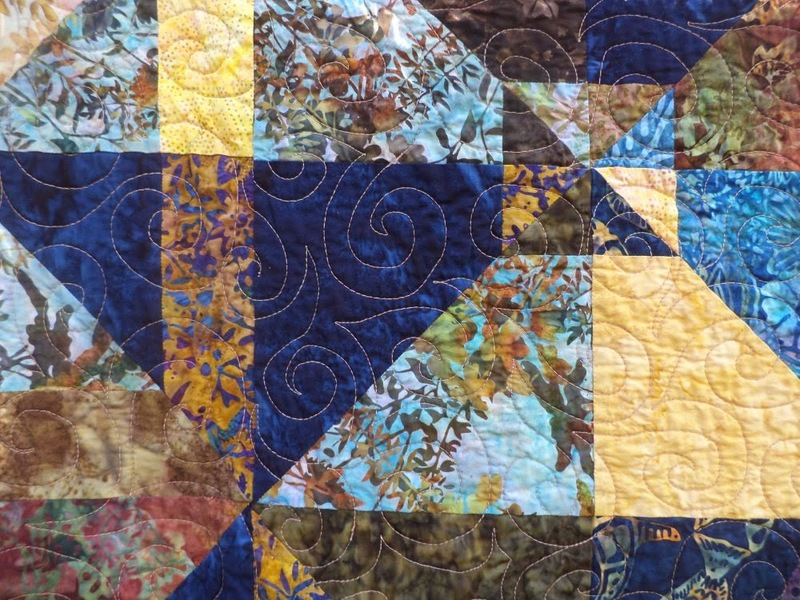 This is a design from Angela Walter's book that I have used on several quilts. I am still not really happy with my skills on this one, but it gets better every time. For the backing I splurged on a pretty batik with birds and bound it with the same. 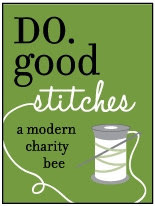 Along with a finished quilt, this week you get some unsolicited info about me! I saw this on The Floral Suitcase and it was too much fun to pass up. 1. I prefer scrap quilting, feel free to send all your scraps to me!! I just find scraps more inspiring than whole cuts. I think I like the challenge of making something useable and pretty with limited amounts/shapes of fabric. 2. I never press if I can help it and I rarely pin. I also avoid trimming my blocks if I think I can get away with it. 3. My attitude toward mistakes is "I'll do it better next time." I'm a firm believer that my quilts will never be viewed as close up as I am when I'm making them again. As long as it will look fine from a few feet away I leave it in. 4. I have a major weakness for blue and green. Like I probably have more blue and green fabrics than the rest of my stash combined. 5. I really don't like the Cotton+Steel fabrics much... except for maybe a couple of prints. Don't like Kaffe at all and don't care much for Liberty either! Go figure. 6. I love wonky and modern, especially putting a modern spin on traditional designs. Also, see above-- I don't pin. I was made for wonky quilting. 7. I quilt starting from one corner and moving around the quilt clockwise til I've done the edges, then do the center last. 8. I use flat sheets from WalMart for quilt backings. And you know what? They make awesome quilt backs! 9. I have never prewashed a fabric in my life, and in 5 years of quilts I have only had one run. Besides, I really like the krinkle quilts get from the dryer when all the fabrics shrink up. 10. 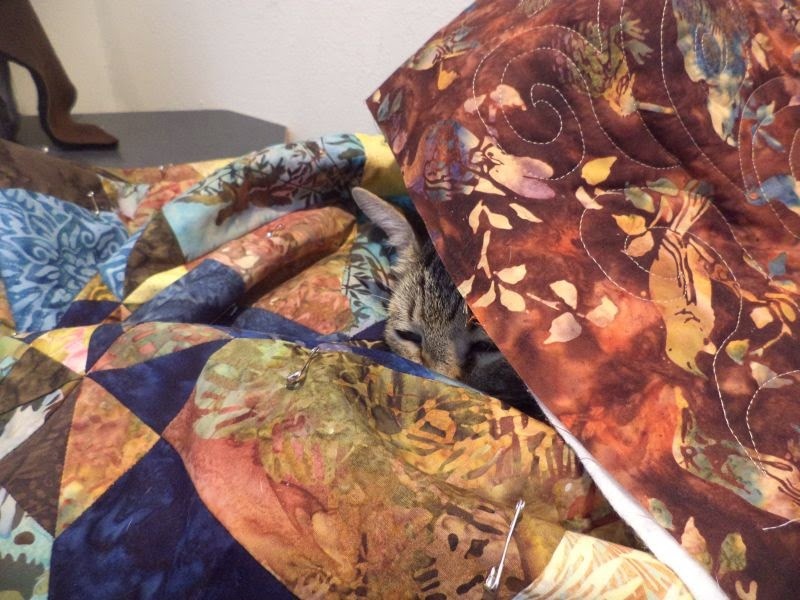 I hate quilting FMQ feathers. I don't mind seeing them on other people's quilts, I just don't like using them myself. It feels so... Victorian or something. Like only lady perfume and pink crushed velvet and lace. Not the vibe I want for my quilts. So, that was fun! What about you, any secrets to share? Linking to Finish it Friday at Crazy Mom Quilts and 13 Spools. Kat, I can see why your (mom's) quilt soothes her soul! Beautifully done!! And that backing fabric is to die for!! I wish my fabrics would multiply and replenish when I'm not looking! This turned out gorgeous, and it was fun getting to know more about you with the secrets. The quilt is beautiful and would 'soothe' anyone's soul. The back is a great contrast to the blues. Great choice. Love your quilt. 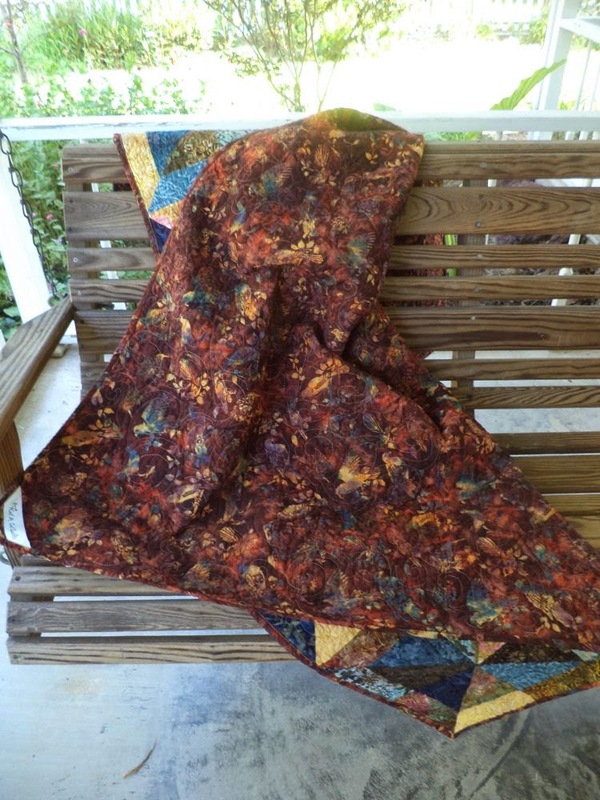 I will share some of my quilty secrets: I don't like batiks, used to prewash all my fabrics 10 years ago, today I just use a Shout Color Catcher when I wash my finished quilt, hate the inaccuracy of precuts but continue to buy them (duh!) and since Cotton + Steel is so new I can't comment but I have never been a huge Kaffe fan. To each his own, I guess! :) I would be glad to send you a bunch of scraps! What great fabrics. The backing fabric is particularly pretty. The quilt is terrific. I have a plan for something similar but need to make space in my life to execute said plan! I know JUST the person to give it to, also. Thanks for the inspiration. 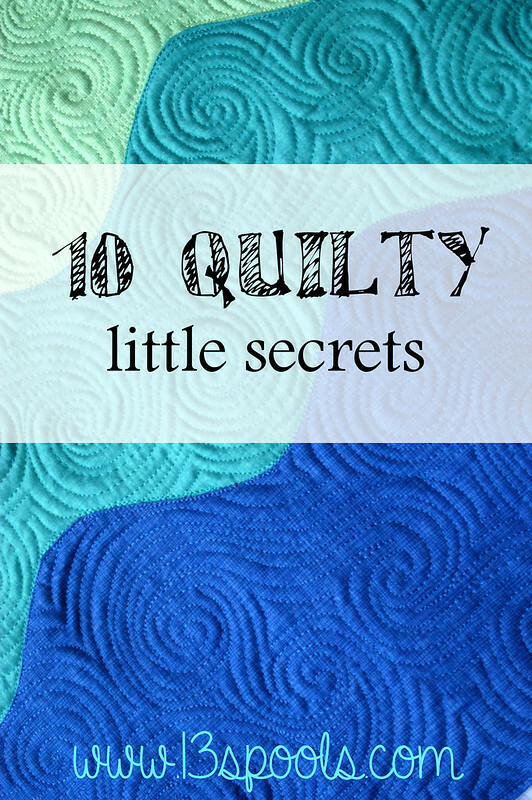 enjoyed reading your guilty secrets and love the quilt, I have this one on my to do list, just need the fabrics! I'm so glad I'm not the only one doing the Walmart sheet thing! I hate feeling guilty about it, but they are so much cheaper/easier and no one looks at the back of a bed quilt anyway! Blue and green fabrics are my weakness as well! OMG I did not know anyone just like me who use flat sheets from Walmart for backings. Gotta love it. Love what you've put in your secrets part, I will have to have a think about what mine are, I also don't baste - can't stand the process so don't bother, I an live with a few folds and catches - but the other day I discovered that if I'm just doing an all over quilting pattern, if I quilt from the back, if I've got a weighty heavily pieced front, it holds it's shape better. My weakness for fabric is autumnal colours, I just keep going back to them. I agree with you wholeheartedly on #5 & #10. I have warmed up a bit to Cotton + Steel, but I prefer the basics to the prints for the most part. 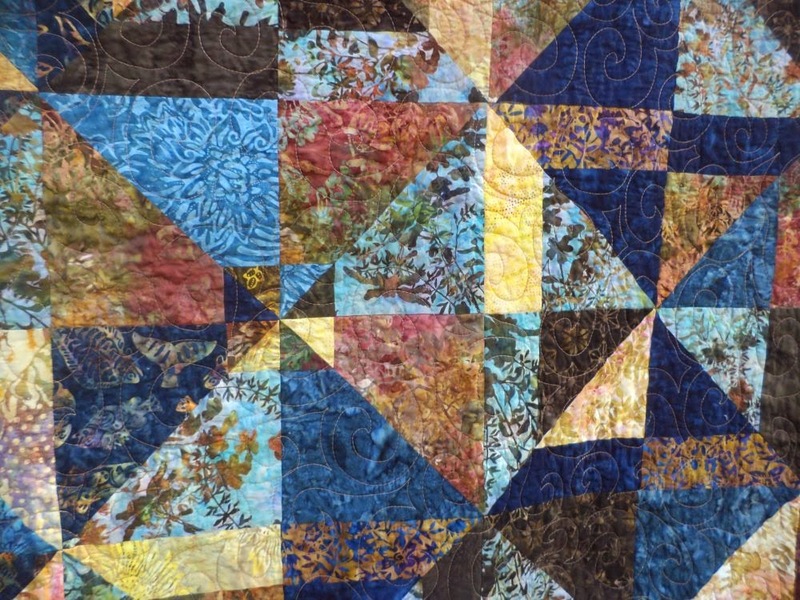 Thanks for the insight into how you work as a quilter!